Rider can run on multiple platforms: Windows, macOS and different breeds of Linux. If you want to edit, build, run or debug Unity or .NET Core applications on a Mac, here's your full-blown IDE. Rider boasts 2200+ live code inspections to help you detect errors and code smells. 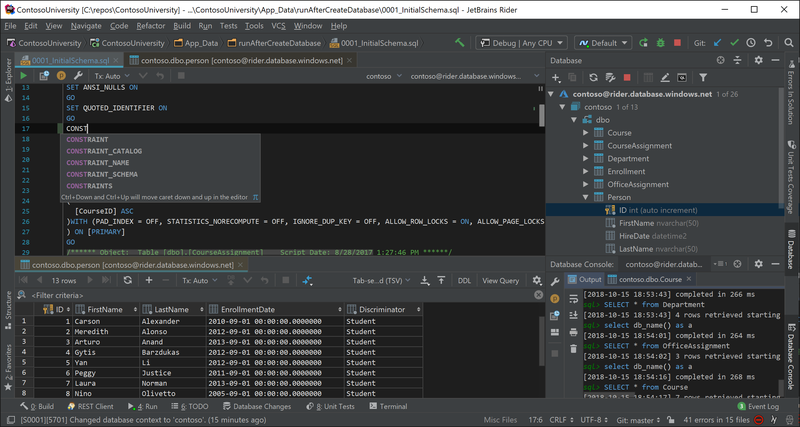 Over 1000 quick-fixes are available to resolve detected issues individually or in bulk: just hit AltEnter to pick one. For a bird's-eye view of errors in your projects, use solution-wide error analysis (SWEA): it will monitor errors in your code base and let you know if anything goes wrong, even you don't have a problematic file open in the text editor. 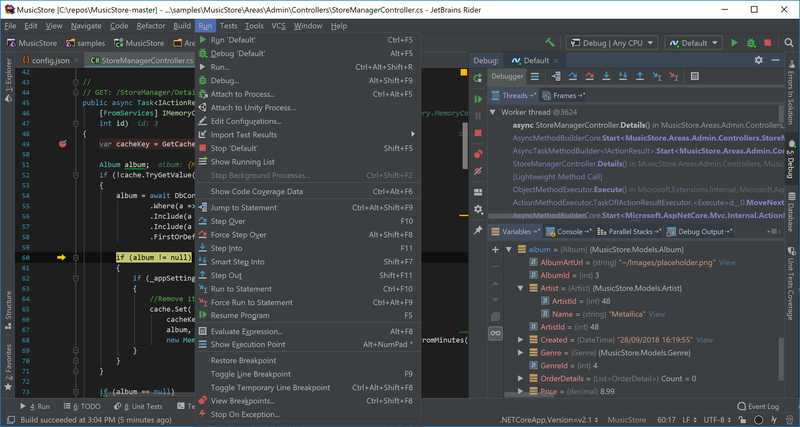 Most of ReSharper's 60+ refactorings are already available in Rider, and its 450+ context actions are all there. 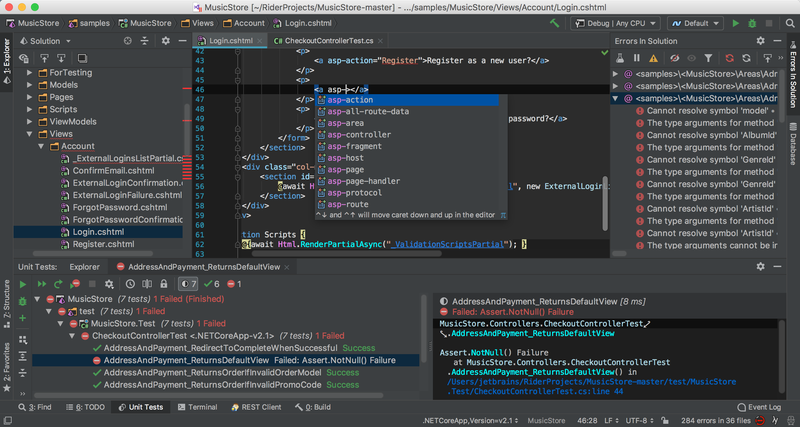 You can rename, extract methods, interfaces and classes, move and copy types, use alternative syntax, and a lot more! 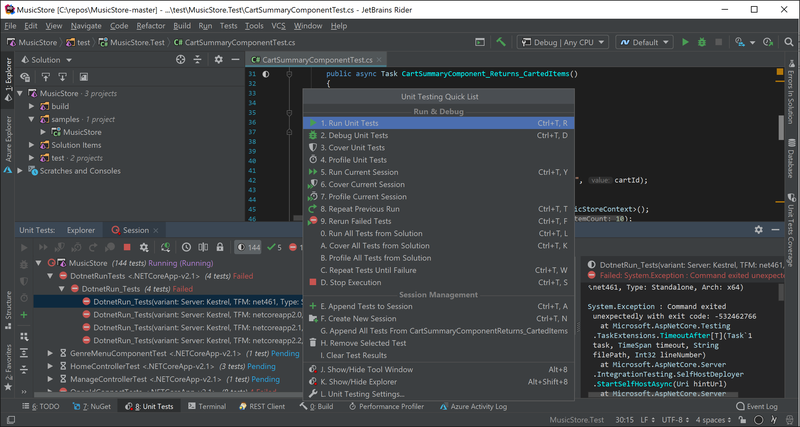 Look for available refactorings in the Refactor This pop-up, or use context actions that you can access with AltEnter. 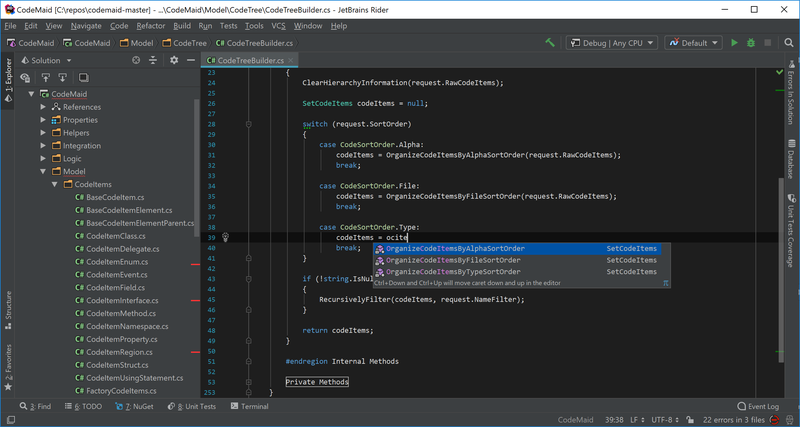 Rider lets you run and debug unit tests based on NUnit, xUnit.net or MSTest in applications targeting .NET Framework, .NET Core and Mono. 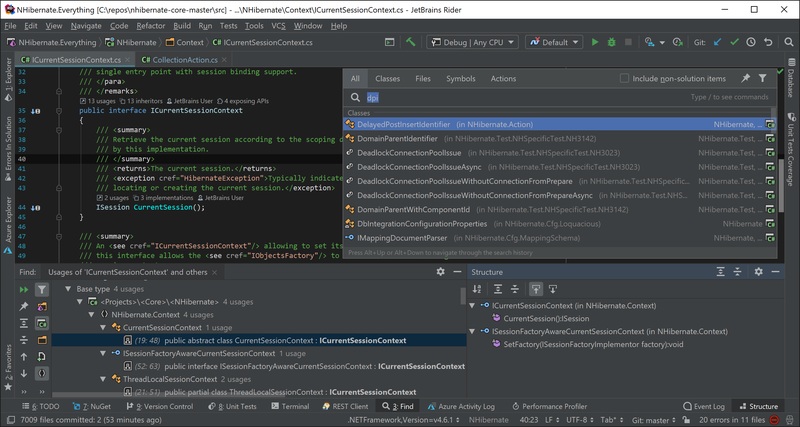 Rider marks test classes and methods with a gutter icon in the editor: click it or use the AltEnter menu to run, debug and manage tests. You can explore tests, group them in different ways, break them down into individual sessions, see test output and navigate to source code from stack traces. 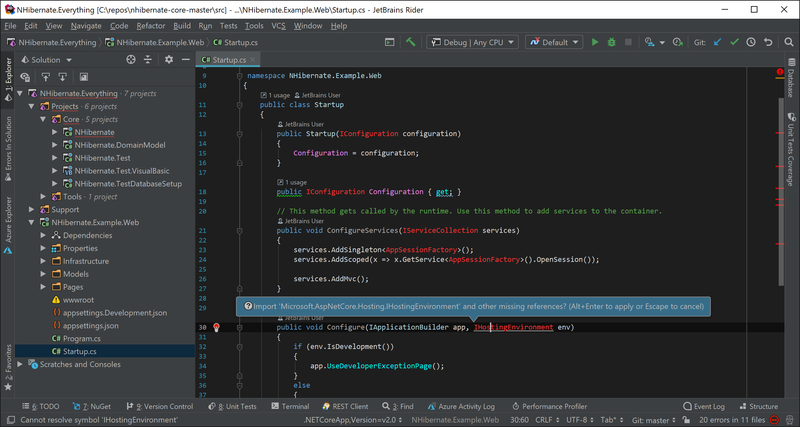 Rider includes a debugger that works with .NET Framework, Mono and .NET Core applications. 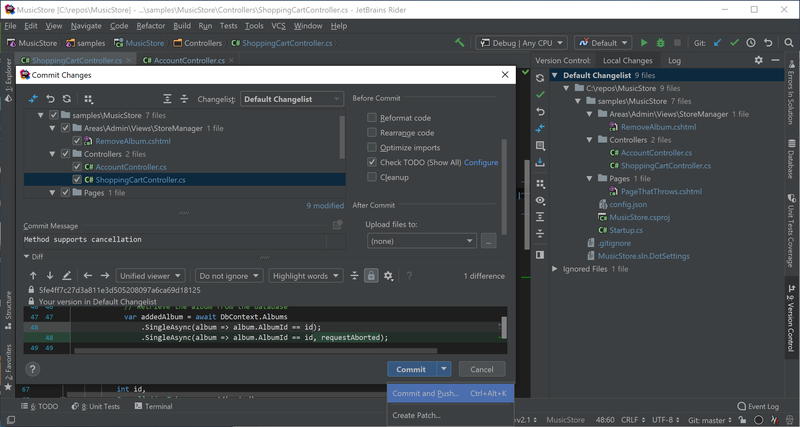 You can create multiple debug configurations, attach to external processes, set and manage breakpoints and breakpoint conditions, step into, over and out, run to cursor, set watches, evaluate expressions and explore threads. 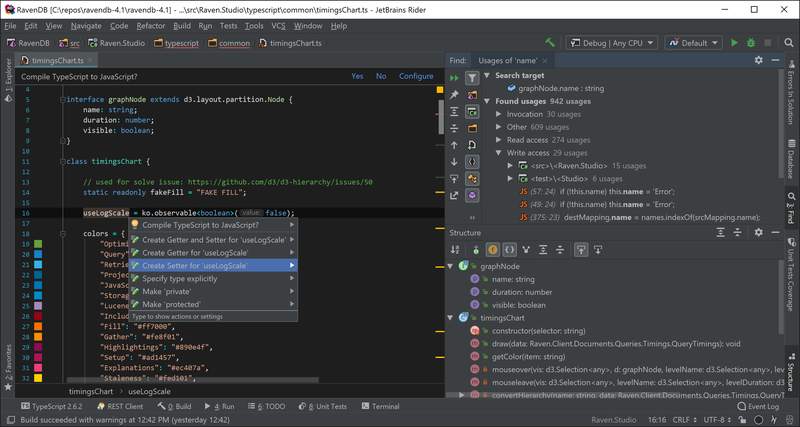 Rider includes support for Git, Subversion, Mercurial, Perforce and TFS out of the box, with more version control systems supported via plugins. 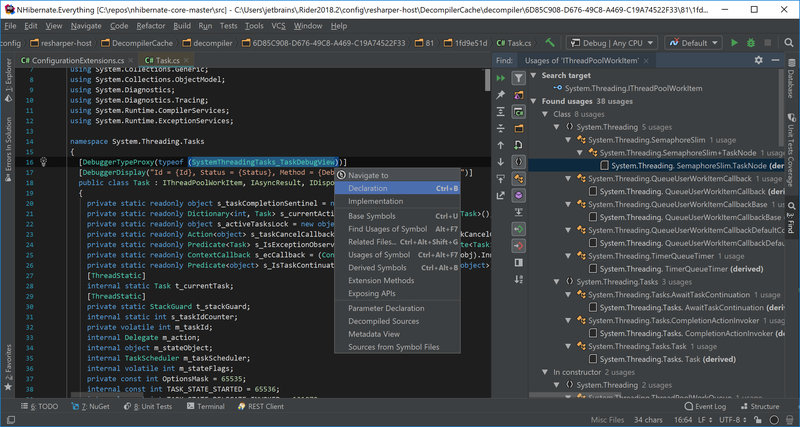 In the code editor, local changes are highlighted as you type. Using a dedicated VCS tool window, you can view local, incoming and repository changes, manage changelists, shelve changes for later use, view diff, commit and push. A built-in visual merge tool will help you resolve conflicts, and Rider will even let you know if a file you are working on has been changed after your last update. You can work with SQL and databases without leaving Rider. Connect to databases, edit schemas and table data, run queries, and even analyze schemas with UML diagrams. 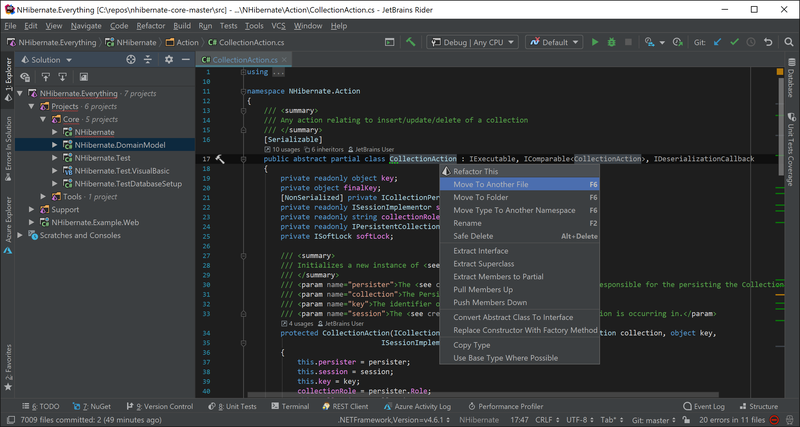 Rider's rich SQL editor comes with syntax highlighting, smart code completion, on-the-fly code analysis, code formatting and navigation. 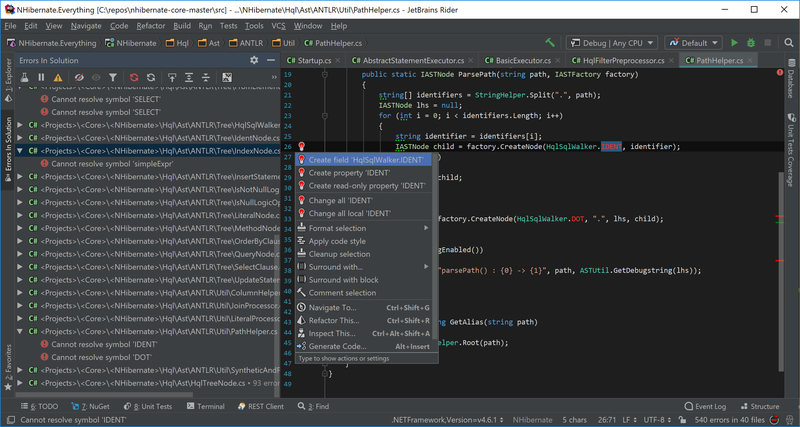 Rider takes advantage of its roots by supporting a wide array of plugins developed for the IntelliJ platform and ReSharper. In addition to bundled plugins (such as those for VCS, F# and Unity support), you can choose to install more plugins as you need them: when you open a file supported by a plugin that you're not using, Rider will suggest that you install it. For example, plugins are available that support Markdown, .gitignore files and Python scripts.